Registration is mandatory. We guard the privacy of every participant. Anonymous visitors may read articles and some resource pages, such as this one, in the public areas of the community, but they may not enter into our private conversations which are conducted in an area of the site closed to public view. However, for those who wish to participate, registration is free and easy (like some of us!). To visit the community, click here. If you have recently applied for membership in the community or if you plan to do so, please note that your account will not be active until you have been contacted for personal verification and your application has been approved by the community administrator. We have designed a registration and membership process that intentionally discourages all but those who feel membership in this community may respond to a conviction that surrender, as we understand and practice it, may be an integral part of a life journey. 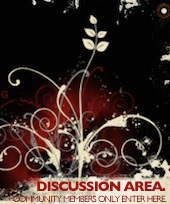 The discussion areas are intended for adult women over the age of 28 only. All registrants, no matter where in the world they are located, are personally contacted by telephone or conferencing to verify their eligibility for membership. Very often, participants who have departed the community because of an inability to meet the participation requirements later seek re-admission. When this happens, re-screening is necessary. For the sake of the privacy of the entire community, no exceptions may be made. Our community is for women only. We are not at all welcoming to husbands or partners who wish to visit the community’s private discussion areas or to men pretending to be women. This is not a personal issue for each of us to decide nor an indication of our disrespect. It’s a community intention. The types of conversations we hold and the frank nature of the support we provide to one another demands a strict women-only policy. Our number is limited to 100 active members at any one time. New members replace those who have become inactive. Because of the challenging nature of the community, there are usually places available – although sometimes the waiting period can sometimes be rather lengthy. There is no automated process for registration. Please contact a watchful sister who will guide you through the registration process. Send a brief note to [email protected]. Please give the administering sisters your reasons for wanting to join the community. The explanation need not reveal any personal details, but it should indicate a reason for wanting to participate here. This simple step helps us discourage casual applicants. If you have already registered, you may contact a community administrator to inquire after your application. We require the use of an email address to which only you have access. This is done to protect the privacy of the entire community, as some automatic correspondence contains direct links to community content. We recommend g-mail, yahoo! or hotmail. They provide private email free of charge. 1. The community administrator will send you a message confirming receipt of your note. 2. The note will be forwarded to a community volunteer who will correspond with you to discern your interests, then confirm your interest and appropriateness by telephone, webcam or other appropriate means. 3. In due course you will receive a notification informing you that your membership is active. This will enable you to post an introduction. Following that final step, you will be welcome to join in community discussion areas available to new participants. As a rule membership applications and registrations are fully processed and made active within 72 hours, often less. Without violating the privacy of new registrants we try our best to know to whom we are entrusting membership: we are extremely concerned that the security and safety of our community be preserved so we do apologize for this careful procedure. We hope, however, you will appreciate the reasons for it.